At the beginning of January, Tao Dan park, normally filled with people exercising, walking and practising tai chi, began its annual transformation into one of Saigon’s most popular Tet venues. The usual calm of this green space will, for the holiday period, be replaced by a festival atmosphere as families gather, many of them in their traditional Vietnamese dress, to enjoy the beautiful displays of flowers and live performances. The main entrance on Truong Dinh always features a scene of animal sculptures representing the new Lunar Year. In 2018, a family of dogs made of shrubs was placed there; this year you’ll find a collection of glistening golden pigs set against a backdrop of giant flowers made up of hundreds of yellow chrysanthemums. The colourful floral creations and magical animal sculptures throughout the park provide an ideal setting for Tet photos. You may have to wait a while to get that perfect shot but it's nowhere near as crowded as the Flower Street Festival on Nguyen Hue. Add to that the impressive collection of bonsai trees, displays of interesting rock sculptures and the ornamental fish tanks all set in the relative cool shade of the park’s majestic trees, and it’s a pleasant way to experience the Lunar New Year in Ho Chi Minh City. At the corner of Tao Dan park closest to Nguyen Thi Minh Khai Street you’ll find a collection of amusement park rides, merry-go-rounds, inflatables, a ball pit and simple fairground attractions for young children. Adjacent to this is the boat pond where aspiring young sailors can take a turn in one of the brightly decorated crafts. Look out for the family of piglets at the center of a raised flower bed as you make your way there. Disneyland it isn’t but then neither is the entrance fee. Pathways winding through the manicured grounds are lined with booths selling local artisanal products such as honey, incense, wind chimes and lucky money trees made of semi-precious stones. There is also an opportunity to see calligraphers at work using their traditional brushes to create works of art and marvel at the carefully choreographed dragon dances. Food stalls offer a variety of freshly cooked Vietnamese street food including the deliciously crispy rice flour pancakes known as banh xeo, noodles, fried rice, grilled sausages, pork and squid, as well as packaged snacks, ice creams, soft drinks and intriguing-looking jelly drinks. Grab a bite and a drink, find a comfortable spot and join the Lunar New Year celebrations. Tet in Saigon can be a wonderful experience. In the meantime, those fond of their early morning or evening stroll at this popular park in the heart of District 1 will have to look elsewhere. Dates: The festival is on from 30 January to 10 February. Entry Fee: Adults VND30,000. Children under 12 free of charge. A program of events for each day, in Vietnamese only, is posted at the entrance. Tickets for the rides and fairground activities are available at the booths inside the park. Saigon Sky Deck on 49th floor in Bitexco Financial Tower is organizing “Lantern Galore” event to celebrate the Mid-autumn festival from September 23rd to 30th. The event will display 200 hand-made lanterns created by participants at the tower’s restaurants during the week of the event. The best lanterns will also receive prizes such as dinner vouchers, Adidas shoes and backpack. This is a great opportunity for Saigonese to showcase their creativeness and for foreign visitors to learn about lantern history and enjoy the colorful Mid-autumn festival, for busy parents to gift their beloved childrens, and for Vietnam to preserve a great cultural activity in a modernization where electric lanterns have replaced a big part of beautiful hand-made lanterns. This is such a beautiful metaphor to celebrate and keep alive Vietnamese tradition by lighting those hand-made lanterns among the city's thousands lights on top of HCMC's highest building. Đèn ông sao với đèn cá chấm, đèn thiên nga với đèn bướm bướm em rước đèn này đến cung trăng. Đèn xanh lơ với đèn tím tím, đèn xanh lam với đèn trắng trắng, trông ánh đèn rực rỡ muôn màu... "
Blue lantern with purple one, Green lantern with white one, the light looks brightly colorful..."
It was so long time ago such that cultural activity took place throughout Vietnam. From countryside to city, from corner of a small alley to centers of crowded streets, children hands in hands with their friends or in the arms of their parents showed the much of happiness to make a wonderful Tet Trung Thu. Nowaday, the electric lanterns have been created to protect children from fire, however Lantern Neighborhood (Pho Long Den) still exists and displays all of the most beautiful lanterns to enhance the festival. Local Insight: Free admission to the sky deck for customers who have lanterns participating in the festival and 500 gifts will be given to children attending the event on September 30th. Kathleen Brown, her husband John and their two adopted children, Peter Quang and Claire Xuan, are touring around Vietnam during their Christmas holiday. Kathleen is a long-time television producer and /media consultant for humanitarian agencies and her husband, John, a professional photographer. Every couple of days, they will post a story along with photos on their travels and adventures. 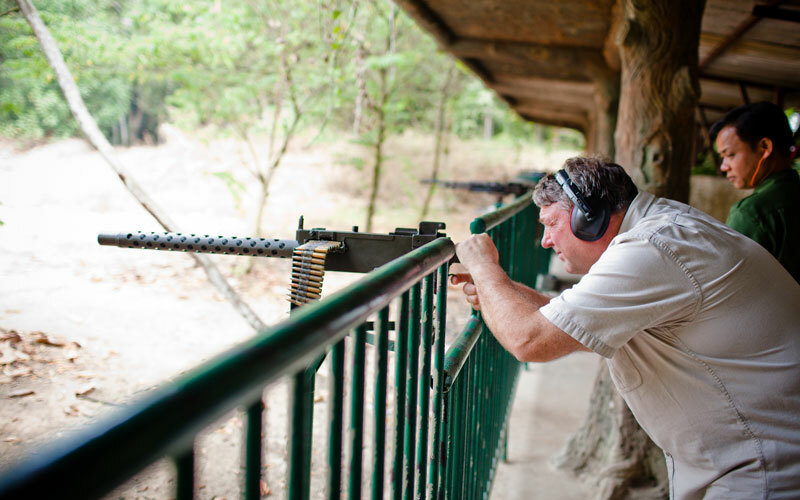 Unlike most other adventures shared on the City Pass blog, this excursion is a self-guided tour. Armed with a map and guide book, my intrepid family decides to spend an afternoon exploring Cholon. Cholon, meaning "big market", is the heart of the ethnic Chinese community, where generations have lived, worked, and established their unique way of life since the late eighteenth century, in Saigon's District 5. 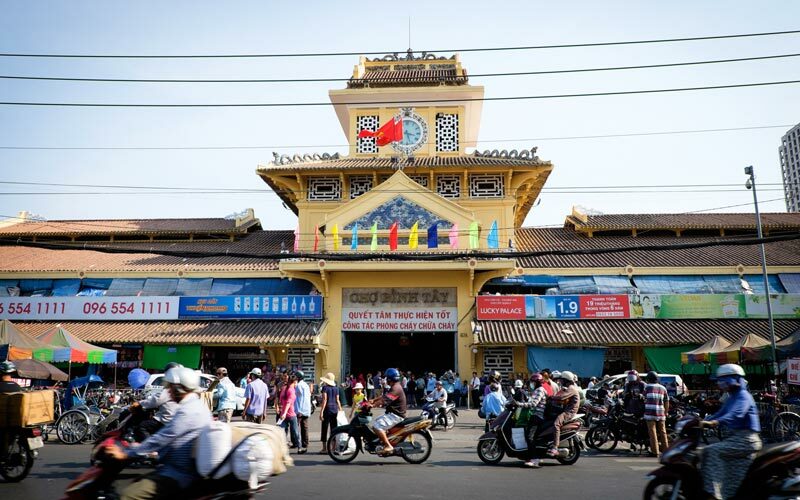 In the center of Cholon, is the venerable Binh Tay Market, a unique blending of both French and Chinese architecture. The colonial building constructed in 1928 houses thousands of shops, stalls, and produce stands where merchants sell every kind of food, clothing, plant, animal, vegetable, medicine, cd and dvd, electronic and home good. It is organized in sections devoted to each particular category of item for sale. Here buyers and sellers are doing business wholesale-- loading crates of eggs and mountains of bags of rice, noodles and towers of shrink-wrapped packages on the backs of their motorbikes. From time to time cages strapped to bikes holding clucking hens or squawking ducks roll by on their way to being raised or braised! Enormous amounts of fresh fruits, greens, vegetables and herbs are sold here every day of the week. It is commerce on steroids; an organizational wonder and a chaotic brew for the senses! Walking through the Binh Tay Market along the narrow indoor corridors you might, as we did, encounter customers riding by on their motorbikes, buyers and sellers conducting business deals, sales people returning to their shops balancing food and coffee for break times, other tourists wandering eyes "wide-open" in wonder at the mysterious grains, packaged items, herbs, as well as, dried, hanging meats, fish, clothing, potions, lotions and remedies, not seen on market days in our homelands. Because we have no guide to lead us into the authentic Chinese restaurants for a lunch stop -- we ease into a KFC for a quick break, a rest stop with familiar fried chicken and french fries, caffeinated beverages and a birds-eye view. KFC's second story perch makes for a great place to view the remarkable frenzy as outdoor vendors conduct business street side! It's a near-equivalent of the last ditch marketing opportunity at the supermarket check-out: our racks of gum, candy bars, People Magazines and tabloids are their toys, lighters, calendars, decorations for the upcoming Lunar New Year celebration and other quick sale items. Our next stop is Cha Tam Church. 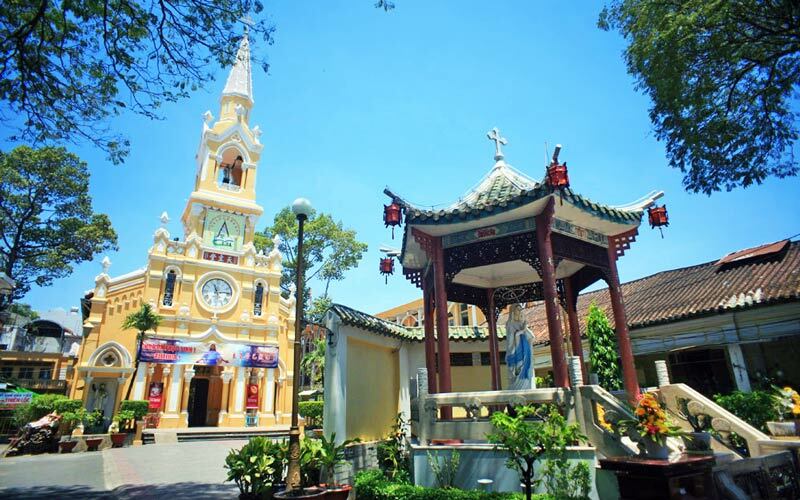 The Catholic Church is a beautiful tribute to both colonial and Chinese architecture -- revealing French influence in the main building behind a Chinese gateway entrance. It is a quiet place in the constantly noisy community; a place of contemplation and reflection, prayers and offerings for God's mercy and grace, protection and healing. In the back right side of the church a plaque marks a pew where General Ngo Dinh Diem and his brother took refuge on 1 November, 1963, before being led away to their deaths. It is a bench freighted with the weight of the dark times and enormous losses of life, both Vietnamese and American, both our combatants and our innocents. Close by, we end our afternoon in Cholon visiting the Quan Am pagoda. We not only visit the God of Mercy in Cha Tam Church, but the Goddess of Mercy, in a famous nearby pagoda. Built in 1740 by Chinese Fukien immigrants, Quan Am Pagoda is said to be the oldest and some report, the most stunning pagoda in the city. We are captivated by the tranquility of the space, the small pond near the entrance filled with fish and turtles, and two lovely statues of Quan Am, the Goddess of Mercy, before whom visitors light incense, bow and offer prayers. 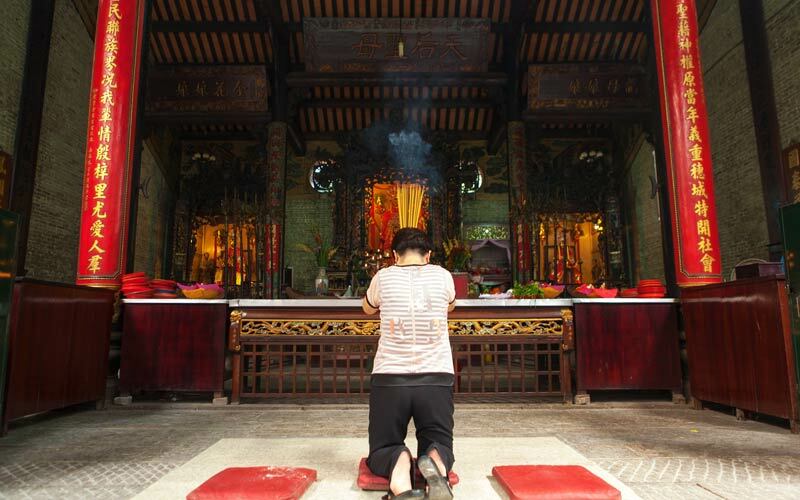 Our youngest, Peter, by now schooled in the lighting of incense and the bowing ritual, performs this sacred rite with a seriousness and ease that is clearly modeled after the many pious pilgrims he's seen at numerous other temples, pagodas and ancestral altars along our journey. As afternoon wanes we hail a taxi to return to our hotel in District 1, on one of the last remaining days on our visit. I am in a somber mood on that cross-town ride, until I spy a beauty salon sporting a picture of Zac Efron, the heartthrob star of Disney's High School Musical, on its store sign! I laugh aloud as I recognize the oddball lunacy of global pop culture wondering whether Zac knows he's featured on a beauty shop marquee in far-off Saigon. Packing for our departure, I just hope we can hold on to the generous lessons from our visit: the kindness and sincerity of our guides; the keen interest people show in our Vietnamese-American children; the Confucian tradition of honoring the ancestors and children; the remembering of "the source", yet the striving to move inexorably toward the future. We shall always cherish this time in our 'adopted' country, Vietnam. Cam On, until we meet again. Can Gio is a swampy island located about 70 km from Ho Chi Minh City where the Saigon River meets the sea. It's been referred to as the "green lungs" of Saigon, as its more than 80,000 ha of mangrove forests help to clean the air of the growing city, and protects and prevents coastal erosion and storms coming in from the sea. Can Gio is listed as a UNESCO biosphere, a forested area which hosts more than 200 species of fauna and 25 species of flora. In fact, it is now the most extensive, protected, mangrove site in the entire world. 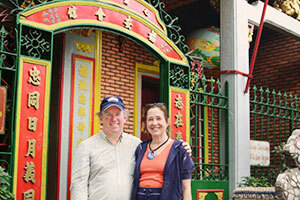 This tour got the biggest smiles from our children, Claire and Peter, during our entire three week visit to Vietnam! 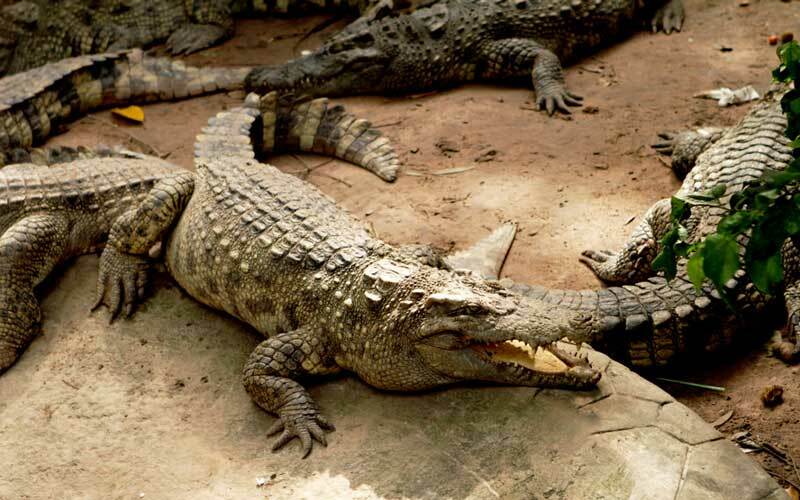 Was it the wind hitting their faces on the motorboat ride to our first stop at the bat preserve or maybe it was feeding the crocodiles during the visit to their protected farm? Or was it the climb to an observation tower high above Can Gio canopy to view the rivers below and green forests spread around like a blanket? 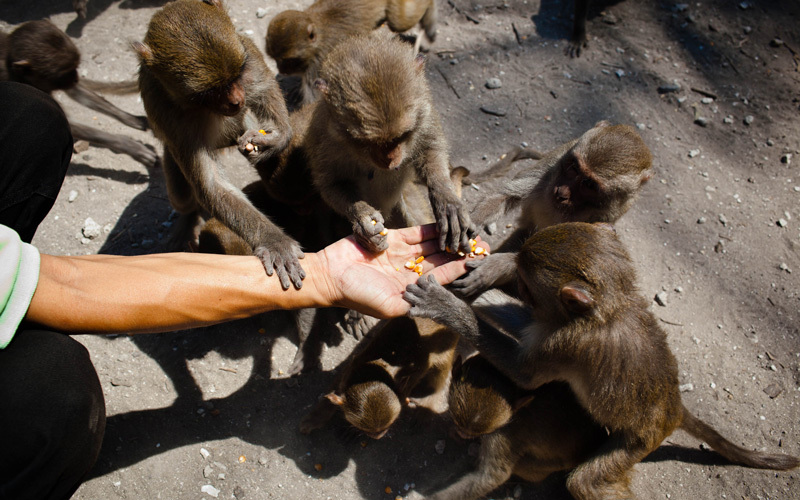 Maybe walking with long-tailed monkeys was the magic? Surely, it was all of the above! Can Gio is a forest full of mangrove trees which seem to arise from below the surface of the silty river delta in tangles and masses of trunks which support other plant life and animal life, securing land and acting as a buffer to erosion and sea storm waters, offering an almost magical and mystical appearance to the landscape. Traveling in a small boat without a motor allows for a near-silent approach to birds, to tree canopy where bats slumber, and to view lotus flowers, water hyacinth, grasses and other exotic flora, whose names we do not know. Slipping through this verdant and abundant forest it is difficult to believe this land had been reduced during the war to a treeless, moonscape of land as it has now, through government protection and the force of international law, been restored to health and tremendous biological diversity. There are even efforts, on-going, to reintroduce wildlife that originally lived in this forest but then fled during wartime. This tour is a virtual National Geographic photo safari -- there are crocodiles and long-tailed monkeys to feed and remarkable vines, bats, twisted mangrove trees and creatures to take digital pictures of and share with your family and friends back home. More than that -- it's a eco-tour of remarkable beauty offering a glimpse of the reforestation of mangrove, now one of the richest and most extensive on the planet. Can Gio reveals to all the sacred pact humans, plants and animals share: we protect and guard one another in this remarkable web of life. Come and visit this place where all things are working together for the good of all. It will bring smiles to your hearts, as well as your faces! 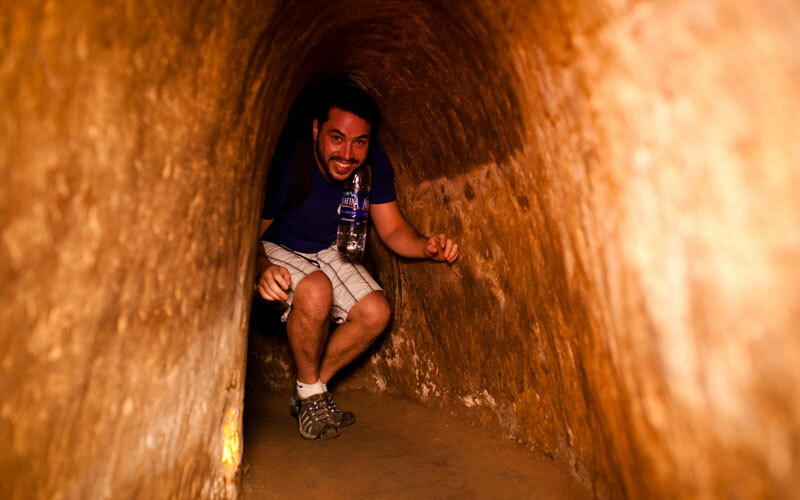 The Cu Chi Tunnels are a huge system of underground tunnels in the area of Củ Chi, one of the five suburban districts of Ho Chi Minh City (Saigon) in Vietnam. They are located forty kilometers northwest of the city center and 25 km away from Tan Son Nhat Airport. The surrounding vegetation is lush. To access the famous tunnels and underground galleries dug by human hands, you must first traverse a narrow wooded trail. 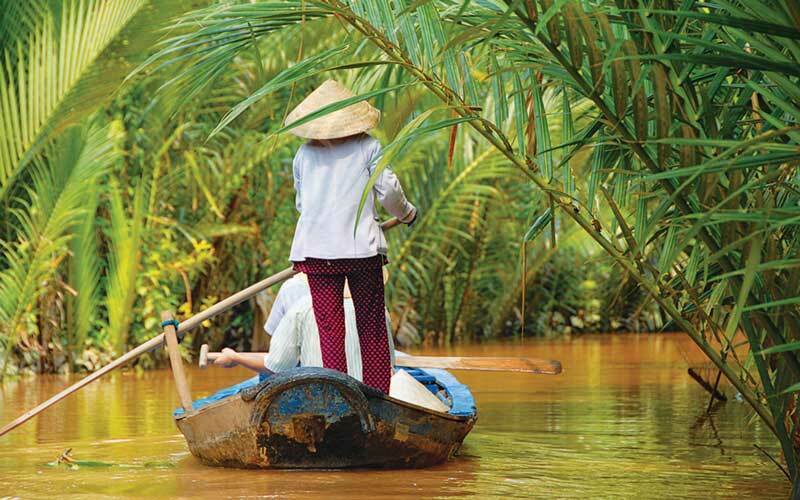 The sounds of insects are deafening giving the impression of entering a vibrant forest, when Vietnam was still teeming with tigers, monkeys and an abundant variety of exotic species. An illusion equal to the transformation that has shaped the country’s in the last 50 years. “Right here, in 1968, during the war against Americans, all life had disappeared on the surface”, informs us our guide. “Only charred trees remained after tons of bombs were dropped by B52 daily. To survive in such environment and to continue fighting, Vietminh fighters had no other choice but to live hidden underground”, he adds. headquarters to plan the Tet Offensive in 1968. They also undertook many guerrilla actions in Saigon by using the extensive maze of tunnels in which Vietnamese fighters could easily sneak. A labyrinth dreaded by American soldiers who had to crawl into unfamiliar, narrow and dark bowels where they could be ambushed at any time by a bullet or fall into a trap made of sharpened spears. Needless to say that any attempts to seize a tunnel was a disproportionate risk. Therefore, the Americans declared the perimeter zone “overkill” but none of the different techniques implemented (bombings, defoliants, napalm, use of rats tunnels, specialized in “search and destroy” commando operations) manage to completely destroy the network. The tunnel system was only about twenty kilometers in length when it was used by the Viet Minh against their French oppressors. At the height of the American War, around 16,000 people lived in the tunnels and it spread over 250 km up to the Cambodian border. Its role in ending the war is probably underestimated. But it was a real thorn in the side of the Americans who never managed to eradicate it completely. “To weaken the GI's, our fighters fired in their legs”, continues the guide while showing us a remnant bunker hidden by surrounding plants, “it forced them to send relief and proved to be more effective in slowing their advance”. Then playfully, he points his finger mockingly towards an American tourist: “With your stomach, you will never be able to crawl into this tunnel”. The tourist smiles. He will finally go through the enlarged 100 meter section specially designed to satisfy the curiosity of foreign tourists. “With the influx of visitors, we have been forced to improve the safety of the site”, concludes the guide stating that a few years ago, unwary tourists had managed to get lost during one day in galleries before finally being rescued. You can visit the Cu Chi Tunnels in Ben Dinh. Located 50 km away from Saigon, it takes about 1:30 to get there by bus from District 1. You can book a tour of a half-day in a travel agency in Saigon or take a leisurely boat ride to the location through Les Rives Experience. 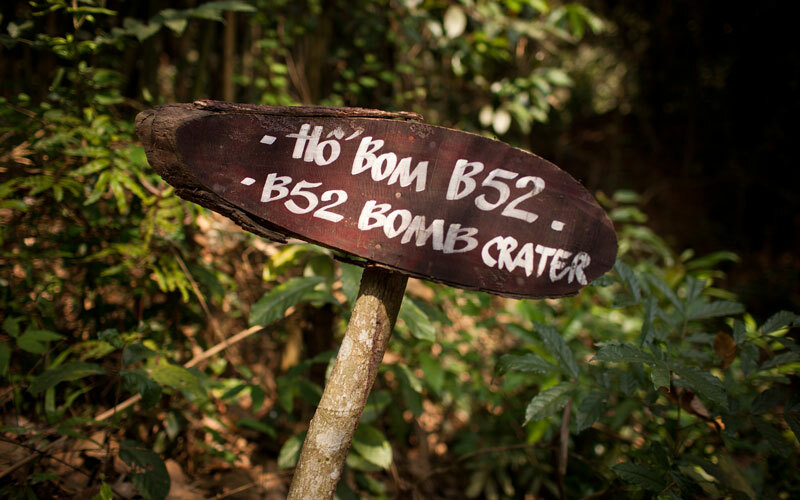 The entrance ticket site of Cu Chi Tunnels is VND20,000 for Vietnamese and VND90,000 for foreigners. Before you set off for what could be one of your most memorable travelling experience to Ho Chi Minh City (or Saigon), do your homework reading City Pass’s Top 5 things to do in Saigon. Some further recommended readings for you are "Best time to visit Vietnam" and How to cross the street. If you time is limited, we invite you to read What to do in Saigon in one day and Things to do in Ho Chi Minh City in 72 hours. And if you are after the round and mouthwatering disks that are called pizzas, check out our article about the best pizza in Ho Chi Minh City! 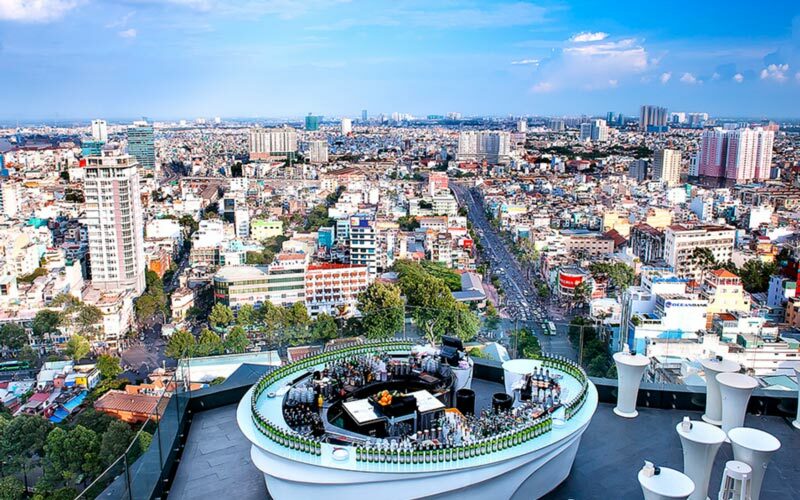 At a fee of VND200,000 per adult and VND130,000 per child (4 - 12 years old), you will get a pass to Saigon Sky Deck, located on the 49th floor and enjoy the superb view of Saigon below. There are telescopes for your pleasure. If a good cocktail is what you are after, go unwind with a drink in the skyscraper’s lounge on the 52nd floor. Local Insight: Opening hours is from 9:30 a.m. to 9:30 p.m. The last ticket shall be bought 45 minutes prior to closing time. Chill Sky Bar is an enviable location for travellers looking to get above the street-level deluge of motorbikes and honking trucks. Spectacular views, sophisticated design, stellar service and excellent food are this rooftop bar’s cornerstones. Local insight: Weekday’ happy hour lasts from 5:30 p.m. till 8:30 p.m.
Coffee is second only to rice in value of agricultural products exported from Vietnam. 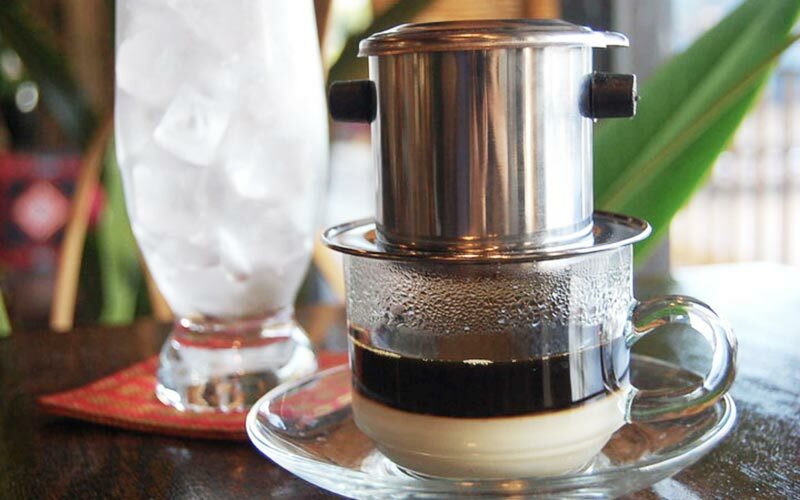 Coffee has became an important part of a Vietnamese everyday life. It is easy to catch a sight of people enjoying coffee at any time during the day. Saigon has different types of coffee shops to meet different demands: watching movies, listening to music, reading magazines, watching street-life, or, oddly enough, even coffee places for couples, cat lovers and Japanese maid theme. Local insight: Vietnamese coffee is almost exclusively Robusta. Robusta strains contain about 40–50% more caffeine than Arabica. For local style, head to Trinh-Coffee where some of the most popular songs by Trinh Cong Son, a talented music composer, are performed. Phở is a must-try whether you like it or not. If you don’t try phở, then you’ve never been to Vietnam. Don’t try street-stall food until your stomach has become acclimatized! Some of our recommendations: Phở Pasteur, Phở Hòa, Phở 24h, Phở 2000, Phở Hùng and Phở 5 sao. It’s best if you have local friends to take you to stalls that serve for the local, not the tourists for the genuine experience of Phở of Vietnam. Check out Top 5 must eat dishes in Saigon and Top 5 che to round off your Saigon’s street food tour. 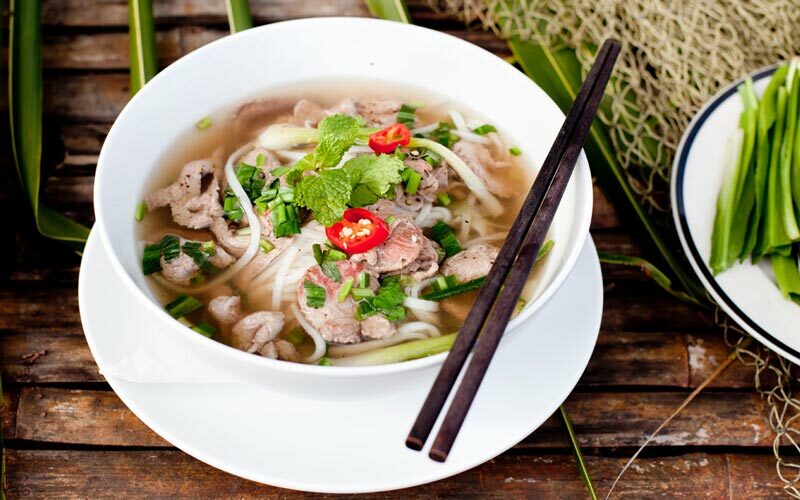 Local insight: Take your time to try some other traditional foods, such as Bún Bò Huế (spicy beef noodle soup) and Cơm Tấm (broken rice) among others. HCMC is home to hundreds of bands and DJs. 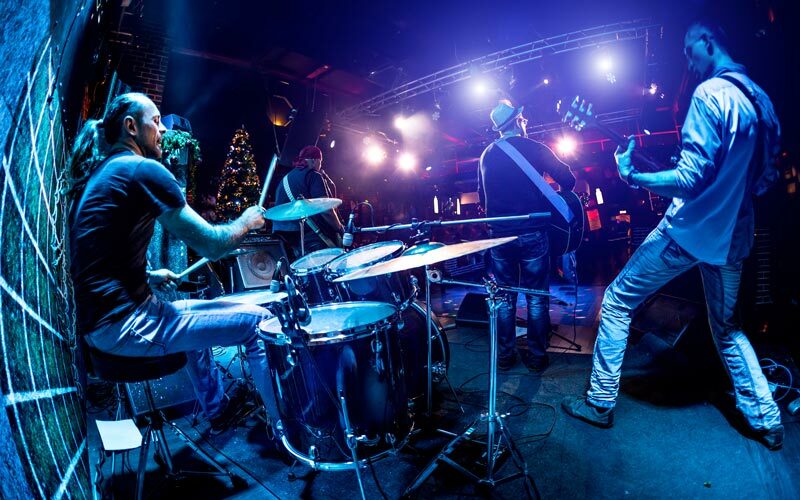 You can enjoy live music from over 20 bars and cafés in the center of HCMC. Check our list of Saigon best bars and cafes. Making Vietnamese food is not a “Mission Impossible”. All you need is a passionate and ready-to-make-mistakes attitude. 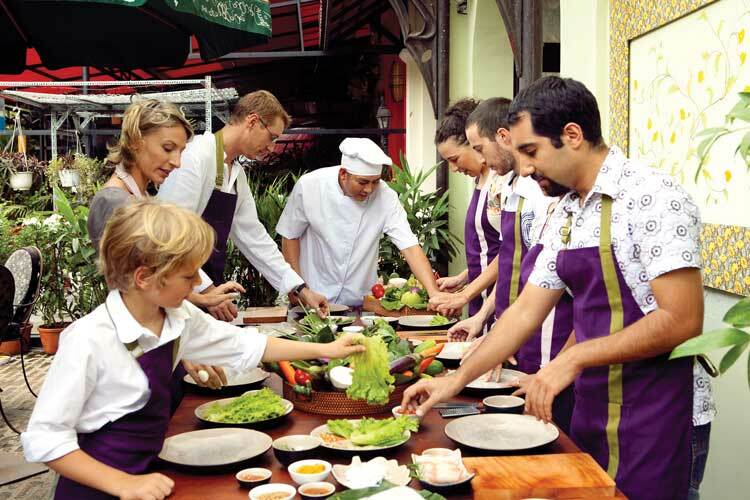 You can start first with your Vietnamese friends and make easy ready-to-eat pieces. So you will feel like a ‘master’ the next time you go eating out and do your own wrapping roll. Further activities you can join are listed in our HCMC activities articles. Our last tip is, you can get VAT refunds in Vietnam at some shops, so do not mind asking the cashiers or the owner about that. Feel free to share your stories on our website and Facebook. Enjoy your trip with City Pass Guides and discover the city on your own.